Following up on "Lifting the Curse of Static Credentials", everybody should look closely at how they handle shared accounts, robot users or technical logins. Do you really rotate passwords, tokens and keys each time somebody who had access to the account leaves your team or the company? Do you know who has access? How do you know that they didn't pass on those credentials or put them in an unsafe place? For all intents and purposes, a shared account is like anonymous access for your employees. If something bad happens, the perpetrator can point to the group and deny everything. As an employer you will find it nearly impossible to prove who actually used the password that was known to so many. Or even to prove that it was one of your own employees and not an outside attacker who "somehow" stole the credentials. Thanks to identity federation and federated login protocols like SAML2 and OpenID Connect it is now much easier to completely eliminate passwords for shared accounts. Without passwords the shared accounts are much less risky. You can actually be sure that only active and authorized users can use the shared accounts, both now and in the future. The concept is fairly simple. It is based on the federated identity provider separating between the login identity used for authentication and the account identity that is the result of authorization. In the following I use the specific case of shared accounts for GitHub Enterprise (GHE) as an application and G Suite (Google) as the federated identity provider to illustrate the idea. The concepts are however universal and can easily be adapted for other applications and identity providers. A typical challenge in GitHub (both the public service and on-premise) is the fact that GitHub as an application only deals with users. There is no concept of services or service accounts. If you want to build sustainable automation then you must, according to the GitHub documentation, create a "machine user" which is a regular user re-purposed as a shared account. GitHub even points out that this is the recommended solution even though otherwise GitHub users must be real people according to their Terms of Service. Before we deal with shared accounts we first look at the normal federated login process in figure 1. GHE uses SAML2 to delegate user authentication to Google. User John Doe wants to use the GHE web interface to work with GHE. He points ➊ his browser to GHE which does not have a valid session for him. GHE redirects ➋ John to sign in at his company's Google account. If he is not signed in already, he authenticates as his own identity ➌ john@doe.com. Google redirects him back to GHE and signals ➍ to GHE that this user is John Doe. With the authorization from Google John is now logged in ➎ as @jdoe in the GHE application. As users sign in to GHE their respective user account is created if does not exist. This "Just In Time Provisioning" is a feature of SAML2 that greatly simplifies the integration of 3rd party applications. The traditional way to introduce shared accounts in this scenario is creating regular users within the identity provider (here Google) and handing out the login credentials (username & password) to the groups of people who need access to the shared account. They can then login with those credentials instead of their own and thereby become the machine user in the application. For all the involved systems there is no technical difference between a real user and a shared account user, the difference comes only from how we treat them. The downsides of this approach include significant inconvenience to the users who have to sign out globally from the identity provider before they can switch users, or use an independent browser window just for that purpose. The biggest threats come from the way how the users manage the password and 2-factor tokens of the shared user and from the organization's (in-)ability to rotate these after every personnel change. Many applications (GHE really only serves as an example here) do not have a good concept for service accounts and rely on regular user accounts to be used for automation. As we cannot change all those applications we must accommodate their needs and give them such service users. The good news is that in the world of federated logins only the user authentication (the actual login) is federated. Each application maintains its own user database. This database is filled and updated through the federated logins, but it is still an independent user database. That means that while all users in the identity provider will have a corresponding user in the application (if they used it), there can be additional users in the application's user database without a matching user in the identity provider. Of course the only way to access (and create) such users is through the federated login. The identity provider must authorize somebody to be such a "local" user when signing in to the application. The identity provider must be able to signal different usernames to the application during the login process. The real user must be able to choose as which user to work in the application after the next login. 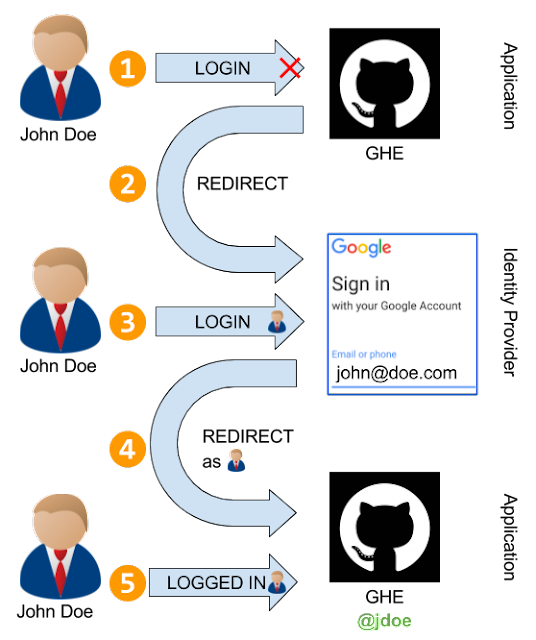 Figure 2 shows this extended login process. For our example use case the user John Doe is a member of the team Alpha. John wants to access the team's account in GHE to connect their team's git repositories with the company's continuous delivery (CD) automation. For regular logins as himself John would "just use" GHE as described above. To login as the team account John first goes to the GHE User Chooser, a custom-built web application where John can select ➊ as which GHE user he wants to be logged in at GHE. Access to the chooser is of course also protected with the same federated login, the figure omits this detail for clarity. John selects the team user for his team Alpha. The chooser stores ➋ Johns selection (team-alpha) in a custom attribute in Johns user data within the identity provider. Next John goes as before to GHE. If he still has an active session at GHE he needs to sign out from GHE, but this does not sign him out at the identity provider or all other company applications. Then John can access again GHE ➌ which will redirect ➍ him to the identity provider, in this example Google. There John signs in ➎ with his own identity john@doe.com. Most likely John still has an active session with Google so that he won't actually see this part. Google will confirm his identity without user interaction. The identity provider reads ➏ the username to send to the application from the custom attribute. When the identity provider redirects ➐ John back to the application, it also sets the GHE user from this custom attribute. In this case the custom attribute contains team-alpha and not jdoe as it would for a personal login. This redirect is the place where the identity switch actually happens. As a result, John retained his personal identity in Google and is signed in to GHE as his team account ➑ @team-alpha. The main benefit of this approach is the radical removal of shared account passwords and the solid audit trail for the shared accounts. It applies the idea of service roles to the domain of standard applications that do not support such roles on their own. So far only few applications have a concept of service roles, most notably Amazon AWS with its IAM Roles. This approach brings the same convenience and security also to all other applications. Unfortunately this concept only protects the access to the shared account itself, not the access to tokens and keys that belong to such an account. Improving the general security is a step-by-step process and user chooser takes us a major step up towards truly securing such applications like GHE. The next step would be addressing the static credentials that are generated within the application. In the case of GHE these are the personal access tokens and SSH keys that are the only way how external tools can use the shared account. These tokens and keys are perpetual shared secrets that can easily be copied without anybody noticing. To get rid of all of this we will have to create an identity mapping proxy that sits in front of the application to translate the authentication of API calls. To the outside (the side that is used by the users and other services) the proxy uses the company authentication scheme, e.g. OAuth2. To the inside (towards the application) it uses the static credentials that the application supports. In order to fully automate this mapping, the proxy also has to maintain those static credentials on behalf of the users so that the users do not need to deal with them at all. In this scenario there is also no need for a user account chooser as described above: users will have no need to act on behalf of the service accounts, the most interaction will be to grant permissions to those service accounts to access shared resources. 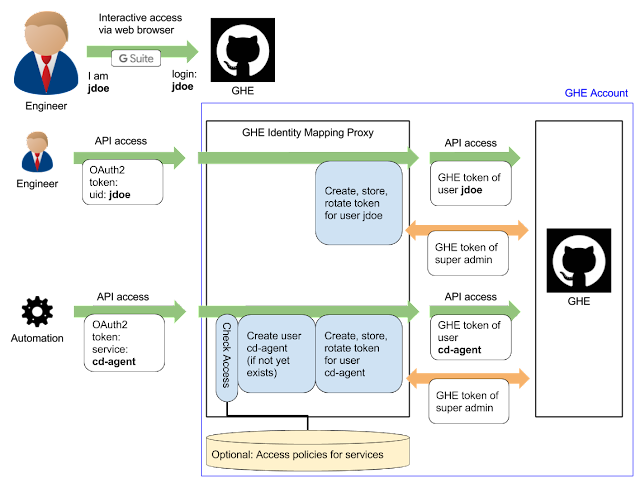 Figure 3 shows how such a proxy for GitHub Enterprise and the company's OAuth2 identity provider, e.g. Google, could be built. It is surely a much larger engineering effort than the user account chooser, but it solves the entire problem of static credentials, not only the problem of shared account passwords. It really is possible to get rid of static credentials, even for applications where the vendor does not support such ideas. While these concepts can be adapted for any kind of application, the account chooser and identity mapping proxy will be somewhat custom tailored. Depending on the threat model and risk assessment in your own organisation the development effort might be very cheap compared to the alternative to continue living with the risks. I hope that both application vendors and identity providers will eventually understand that static credentials are the source of a lot of troubles and that it is their job to provide us users good integrations based on centrally managed identities, especially for the integration of different services.